RUMURUTI, 28 March 2008 (IRIN) – A month after clashes erupted in Kenya’s Rift Valley district of Laikipia West, calm has returned but internally displaced persons (IDPs) are yet to return home, with leaders voicing concern over the acquisition of guns by communities living in the area. “Let us not confuse calmness for peace while ethnic animosity persists,” Frederick Sisia, the new district commissioner for Laikipia West, told a peace and reconciliation workshop on 26 March in Nyahururu, the district’s headquarters. Margaret N. Muturi from Kiambaa – Karuri Njoro Village is asking for help. She is hosting 22 IDP’s from Molo, who need humanitarian assistance and business capital. The IDP’s include 3 males over 18 years, 2 of them fathers to the families, 2 women with nursing babies born during the skirmishes and on transit from Molo, 1 High school boy who needs to go to school, 11 primary school children and 3 kids at home based motherly care. You can contact Margaret on phone 0728 373 303. The Peace and Security Council of the African union at its 115th meeting held on 14th March 2008 in Addis Ababa Ethiopia issued a communiqué, welcoming the signing of the political agreement in Kenya. They called on all Kenyans to support the leaders, and expressed appreciation for all regional and continental efforts made in support of the mediation process. They further requested the commission to remain engaged with the Kenyan parties and support them in the implementation of the agreements. The first batch of graduates from the Kenya Veterans for Peace (KVP) completed their training and had their graduation on the 14th March 2008. The event was presided over by Mrs. Odeng’, senior P.A to the Nairobi Provincial Commissioner. The second batch is currently undergoing training at Peace House, Haile Selassie Avenue. Any assistance from counsellors, and peace building facilitators is highly welcome. VUMA Kenya under whose auspices CCP-USA chapter is operating, is up and running. They are currently involved in various fund raising activities in support of the peace process in Kenya. 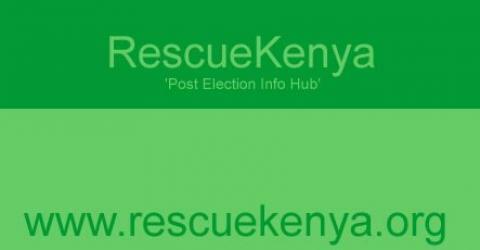 A new online initiative, http://www.rescuekenya.org has been established. This site has information on IDP’s, provides a resource to those who are assisting people on the ground and links up various peace initiatives. www.rescuekenya.org/govt_coordination.php for contacts for specific government assistance. The Leadership Institute of Kenya (LIKA) is still holding their meetings every Wednesday at LIKA offices, on Kirichwa road near Masaba Hospital from 5 – 7 p.m. The meetings discuss the deeper issues affecting our country such as ethnicity, failure of democracy, the youth, money culture and lack of nationhood, as Kenyans seek to go “GO NATIONAL”. In their last meeting, the group decided to get down to action and write books targeting primary and secondary schools based on tribal solidarity and cultural cohesion. The group feels that investing in the youth is of utmost importance. All are invited, for future meetings. The Kenya Veterans for Peace (KVP) continue to hold their workshop at Peace House, Next to Ukwala Supermarket, Haile Selassie Avenue. Sponsored by the Interreligious and International federation for world peace. The workshop seeks to have 200 former security personnel trained. KVP is appealing for counsellors and peace-building facilitators to assist during this workshop, which is ongoing. The first batch of 50, who have just finished the 10-day seminar have their closing ceremony today at 2 p.m. This event will also usher in the next batch of 50 to be trained. The chief guest at the event is the Nairobi P.C. Contact the KVP Secretariat on 0725-203128 or 3588390 if you would like to attend or support this initiative. Guests should be seated by 1.30 p.m. The Universal peace federation in conjunction with the ‘I have a dream foundation’ is organising a 1-day event dubbed Realising the Dream. Martin Luther King the 3rd will be present at the event, which will be held at the KICC on the 18th March 2008 from 830 a.m. The event seeks to have political leaders and other individuals from various groups to discuss the recent post-election violence in Kenya and what various groups can do. All are invited. Concerned about the wave of violence in Kenya since December 29th 2007, we teamed up to roll out a national assessment and response on the post election violence alongside several other intra-community dialogue interventions throughout the country under the Electoral Violence Response Initiative (EVRI. These interventions are geared towards preparing the communities for resettlement, recovery and reconciliation. The National Reconciliation and Dialogue Committee that was formed after a successful national and international mediation has agreed on a number of resolutions to address the root-causes and the consequence of the 2007 post election crisis. Kenya has gone through a traumatic experience characterised by the post electoral violence following the disputed 2007 presidential elections. The consequence of the violence has seen the loss of over 1000 lives, displacement of over three hundred thousand people and destruction of livelihoods of millions of Kenyans. Further consequences have been the growing tension in traditionally calm regions such as Central Kenya. the communities and how such a deal could be achieved at the grass root level. NAIROBI, March 26, 2008 (AFP) – The Kenya Red Cross Society on Wednesday appealed for 23 million dollars (14 million euros) to help resettle hundreds of thousands of people displaced by post-election violence. Secretary General Abbas Gullet said the cash would help rebuild houses, provide seeds for planting and food for long-term relief for the displaced families scattered in the capital and western region. “The government has a resettlement plan but humanitarian organisations should assist them. The task of resettlement requires a lot of co-operation,” Gullet told reporters. He said the agency had received 10 million dollars after asking for 14 million in January at the height of tribal fighting and revenge killings that were sparked by the disputed December 27 general elections . Despite an agreement signed more than a month ago that many people hoped would quell the recent fighting in Kenya, hostilities have continued in this east African country that was once the most stable in the region. The initial conflict erupted over a political power struggle between President Mwai Kibaki and his opponent, Raila Odinga, after a disputed presidential election in late December. Each side accused the other of rigging the election, and brutal clashes arose between members of Kibaki’s Kikuyu tribe, the largest in Kenya, and an ad hoc coalition of clans including members of Odinga’ Luo tribe. In the weeks that followed, violent mobs wielding machetes, guns and other weapons killed more than 1,000 people and drove more than half a million others from their homes.